The wind hurled rain at the windows last night again, roaring up the street, curling around the corners of the house, rattling anything not tied down. Today the wind is easier, less furious, but through the glass I see bare branches waving steadily. The dull grey outside my window is contrasted to soft pinks and greens when I change my focus to the bouquet of flowers on the table. The pink gerbera daisies are my favorites. I love their frilled centers with bright yellow stamens and their layers of long smooth petals. Soon, I tell myself, my own garden will be filled with bright blossoms nodding on long green stems. That's a sunny thought for a grey Sunday. Sharing with Sunlit Sunday, hosted by Karen of My Little Home and Garden, and with Mosaic Monday, hosted by Mary of The Little Red House. Such beautiful blooms and a lovely mosaic. I can't wait for spring! Wasn't that crazy weather last night? I went for a walk along Dallas Rd this morning and it was very breezy! However, I did see lots of crocuses and snowdrops, so it won't be long, Lorrie! So pretty, what a lovely shade of pink. I also cannot wait for spring. What a pretty view on the inside. We had a storm last night, too. Interesting how often we have bookend weather. I hope this evening's weather proves less wild for you, Lorrie, and that all of those branches stay on the trees. You bouquet is gorgeous, full of beautiful pinks and lavenders. It sounds like just the bright spot you need this week. I'm glad you shared it here. The bouquet is very pretty and the mosaic is the very picture of spring! A very pretty mosaic, Lorrie. It has me longing for spring. Here they are predicting 70 degrees by mid week. A big change from our recent snowstorm. We've had a lot of wind this winter, too. It seems like more days than not, I look out the window to see the branches in our Nandina bush swaying back and forth. This has been a winter for the books. I do love Gerbera daisies. Your mosaic is so beautiful and a reminder that summer flowers will be here eventually. What a lovely bouquet. That storm was something fierce last night and another one is upon us right now - much stronger - more wind. It will be up your way soon, if it isn't already there - hang on. What a sweet mosaic! This is a perfect post for Sunlit Sunday. I too love gerbera flowers. Pink color is my favorite. I find few years ago that gerbera flower has another name of "hope". I remember that I posted those flowers for the victims in Northern part of Japan where the big earth quake happened three years ago. Gerberas make such a bold statement in a bouquet. The various shades of pink make this look like a breath of spring. Longing for spring here, too. Lovely collage, Lorrie. It sounds as though you could be in England, Lorrie! Flowers help give the day a boost in this awful weather. I have cheerful red Alstromeria in my vase. 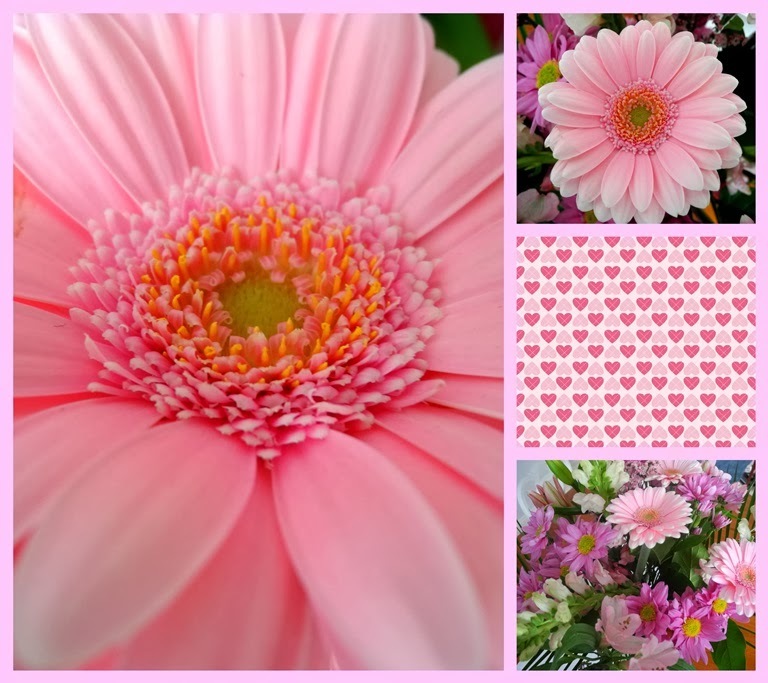 I love the pink gerbera, they are beautiful. I am looking forward to seeing the spring blooms.. Have a happy week! How lovely to have the pink inside when you change your focus! A happy little flower indeed. I also really admire the china teacups used in your previous post! Your cotton candy pink pretties are irresistible! What a beautiful mosaic to celebrate this month of romance, so cheery and charming! We got that storm down here too - boy, was that nasty! I'll have to go outside today and clear up any debris, I'm sure there is some! Feruary's been cloudy and mild . Hepe winter don't come at all this year . I need to get some flowers myself too for sure . Your flowers are so pretty Lorrie! They brighten a winter's day with all those shades of pink. Have a wonderful week! Cheery and very pretty~~ We have some sun today and I'm thrilled. Focusing on your bouquet is a sure way to brighten a grey day! We have had wind and rain over here as well for the past few days. There is nothing nicer than a beautiful bouquet of fresh flowers Lorrie, it lifts the spirits. In my winter I can't live with out fragrant candles and a few fresh flowers - they give me hope! Your Spring is just waiting in the wings and I'm looking forward to a virtual visit with you to the world class Butchart gardens again! Your pink gerbera daisies are gorgeous. I was just commenting to another blogger that spring and flowers must seem like a miracle each year when the snow melts and flowers begin popping up everywhere. A bouquet of flowers in winter does more for the hope of one's soul than any springtime or summer flower arrangement can ever do! What a gorgeous mosaic. Just perfect for a still cold, still snow around, slightly gray day! Thanks! Beautiful photos! And that pink color is exquisite. This is a gorgeous flower mosaic! It was extremely windy in my area last night, too, Lorrie! 60 to 70 mile per hours winds. It was lovely today though, in the low 60's. Ohhhh pink I think...sigh. That's gorgeous. First things first...how beautiful is your new little grandson! May God bless and keep him every day of his life! Secondly, your felt popscicles are TOO adorable--love them:) And I love the pink polka dot cookies--Mmm! And now--a beautiful pink themed post! I adore pink and yes, it's the perfect thing for a grey day! We as well have been hit by storm after storm recently. Thankfully no damage here and we've even been able to make lots of little trips in dry weather with visiting family. Beautiful!! I clicked on your Mosaic Monday link without a second thought,,,I was drawn to the bright color and hope of Springtime!! Your bouquet just cheers a cloudy day!